While I try to keep the thoughts that I share here on my blog positive and upbeat, too often I find myself feeling bitter and stone-hearted at the amount of “fluff” being tossed around the edu-blogosphere. While thousands of blog posts are tweeted and bookmarked about how “stupefyingly awesome” new website “X” is, it can be hard to find the proverbial “diamond in the rough” that combines both the raw enthusiasm for a really cool web tool, and thoughtful teacher practitioning using said web tool. Don’t get me wrong! I fully understand that there are an elephant-crushing amount of fantastic examples of teachers blogging, writing, and sharing about powerful practice in their own classrooms. However, it always seems that those posts are hidden in an equally large mass of “fluffy” posts, that while serving an important function on many individual’s exploration of new tools, tend to get more of the limelight. Perhaps it’s just my own little warped view of the world, and I should just look a bit harder. Regardless of where I’m looking, the beauty of the internet is that it automagically makes connections for you without even trying, tunneling little roads of creativity into your brain, and paving them with bright neon yellow lines of educational enlightenment from powerful educational practitioners. Thus is how I felt today when I read through Tony Borash’s fabulous post about his use of Wordle within the context of teaching about magnetism. It’s not an overview of how he might use the tool, or an exploration of what Wordle has to offer, but an actual powerful use of Wordle as a reflective tool for formative assessment. Using prior knowledge about magnetism gathered from students using a “write-pair-share” strategy, he dumped all of the comments and thoughts into a Wordle so the class as a whole could see which of their conceptions, or misconceptions, carried “more weight” going into the unit of study. 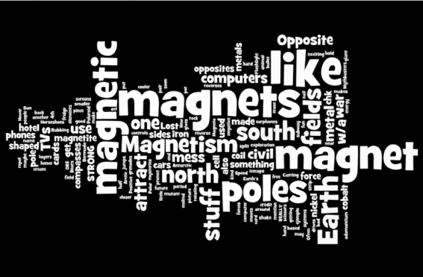 Since Wordle produces those wonderful little word clouds making words repeated more often bold and big, it was easy for his class to see what the class as whole understood about magnetism. Fast forward a few days with a few activities and lessons under their belt, and Tony produced another word cloud, based on the same discussion questions with his students. The difference in which terms and concepts stood out was remarkable, and students immediately gleaned that their understanding of magnetism was quickly leaving the realm of the traditional understanding of “naturally occurring magnetic materials”, and more towards electrically induced magnetism. Without the use of Wordle, Tony’s entire lesson design would have been altered as students would not have had such a powerful way to diagnose and witness the progress of their own learning. This is the kind of highly effective integration of technology that needs to be happening in our schools, is waiting to be happening. I could pontificate further, but this idea isn’t mine, it’s Tony’s, and you really need to read it for yourself. Suffice it to say, I’m a bit jealous of his experience as I’m not teaching in a classroom this year, but I’m really glad that he’s sharing with everyone. Give a click on the link below, and enjoy! Ben- thanks for the shout-out here at Tech Savvy Ed. I saw your post in my RSS feed reader and thought, “Hey, that’s me!” What a great feeling- I’m humbled by your words. Also have to confess- like you, I also find myself in a new role “on the outside looking in,” connecting into many different classrooms instead across our division as an instructional coach and science facilitator. While I’m also more than a little jealous of the classroom experimentation that I miss out on by being out of the classroom, I have been lucky to feel just as energized in the opportunity to connect with all of those teachers I get to talk with, collaborate with, and learn with. Together, we come to much more interesting ideas and solutions than I ever would have on my own. Thanks again for the post- glad to hear that sharing my practice resonated so much with you. Looking forward to your next post popping up in the RSS! I’ve taken to putting my trust in the twitter-sphere and the connections I make via commenters here, and it pays off in wonderful resources like yours. The energizing feeling that you’re experiencing is something I have felt in very short supply this year working with the teachers, and some of that could be due to the nature of the current state in education. However, I’ve begun to capture some of the energy you’re feeling in the past month or so as I get around to more of the teachers in my district. Like you, I often find that my work alone warrants very little fanfare, but when working with others, the ideas seem to be that much deeper and meaningful. Thanks again – hope all is well with you.